I was recently taking a detailed look at the momentum Empirix has been experiencing. It’s been an exciting place to work at over the past few years. That we’ve continued to grow so positively around the world in this economic climate is really impressive. A basic requirement for providing a good customer experience is to make sure the back-end technology works. In many ways, it’s all about risk management – how to contain and minimize unexpected failures or issues in an operational environment. With that in mind, organizations must mitigate the risks associated with deploying new communications technologies, upgrading existing systems and enhancing applications. The best companies with whom we’ve been working commit to best practices when it comes to implementing and utilizing cutting edge communications technology. And many of these companies fall into the Fortune 500 ranking, leading the growing movement toward providing high quality customer experiences. The increasing commitment to quality reflected in our customers is demonstrated by the infographic below. We at Empirix are also committed to quality, as demonstrated by the fact that we were recently named a “Best Place to Work” by Boston Business s Journal. A high quality team produces high quality solutions – solutions that we are proud to offer our high quality customers. Want to learn more? 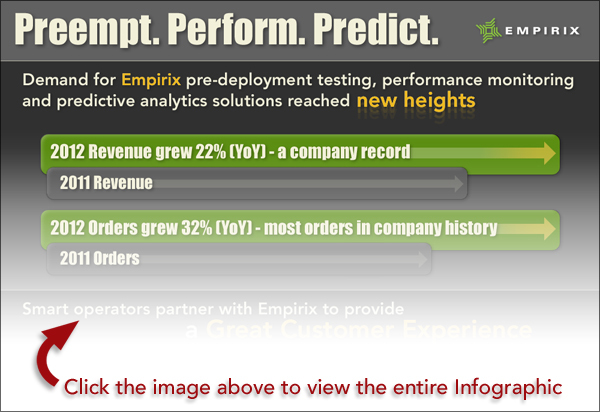 Read about Empirix’s 2012 growth and momentum.